The Forest River XLR Boost is an entry-level toy hauler that your family can grow into rather than grow out of! These 102" and 96" wide-body toy haulers are offered in either a travel trailer or fifth wheel for you to choose. You will also find complete kitchen and bath amenities so that you can keep on having fun for the entire weekend or more! 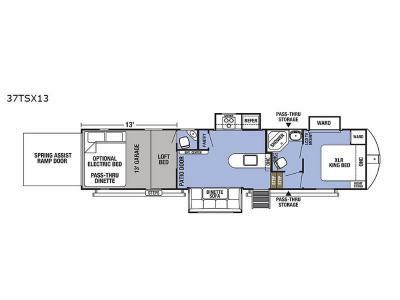 The full-height ceiling and skylight in the bathroom will keep the interior feeling open and fresh while you camp out, and you will appreciate being able to keep all of your electronics charged and ready to go with the USB charging station. So, for all of your off-road adventures, check out the Forest River XLR Boost toy hauler fifth wheel or travel trailer to play with!